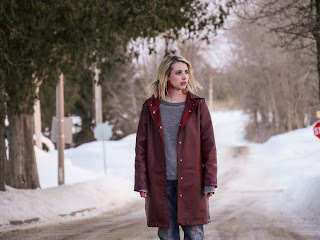 So almost a year ago we received a trailer for a horror movie titled February, and it was interesting for starring Emma Roberts, Mad Men's Kiernan Shipka, and Sing Street's Lucy Boynton. Obviously A24 saw something in it, too, which is why picked up distribution. But here we are all this time later and the film is finally coming out, albeit with the brand new title of The Blackcoat's Daughter. The Blackcoat's Daughter opens May 13th, but DirecTV users can check it out early on February 16th.